"For many years, people in the city of Erie have had to carry quarters," said Christopher Friday, deputy director of the Erie Parking Authority, at Erie Mayor Joe Schember's weekly press conference on August 9. "That ends today. As of today, you can download the meterEZ app and use a credit card for your parking payments." 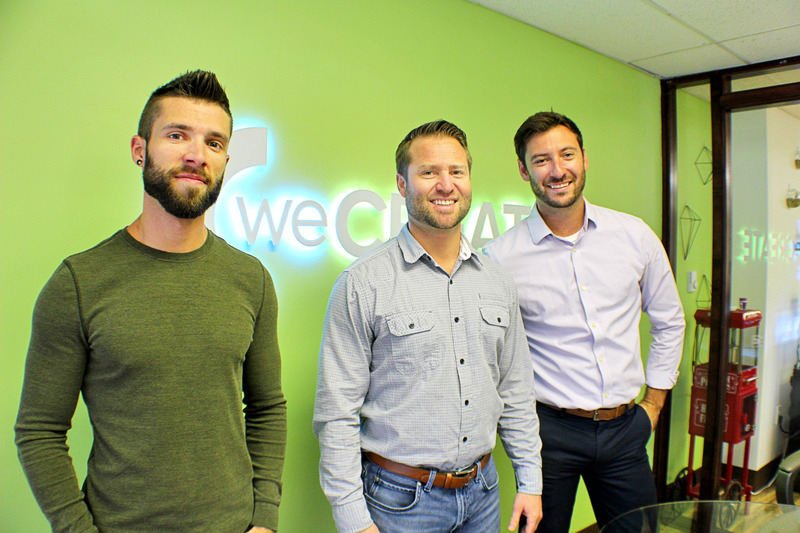 Just moments later, Nate Wheeler and Zach Lanich of weCreate, a web design and development company located in Erie, offered a demo of their new app: meterEZ. Let us just say: Celebrators of coins and touters of tokens, fret not: Quarters and tokens still work just as they always have. If you prefer to jog around with a jingling in your jeans, or love the scavenger hunt of digging into the depths of your car's nether regions for a shiny George Washington, you can continue jogging and hunting all you want. The physical meters in Erie aren't going anywhere for the foreseeable future. And for those thinking: Well, the app only works for those with a smartphone, and not everyone has a smartphone — true, but according to the Pew Research Center report by Aaron Smith, "Roughly three-quarters of Americans (77 percent) now own a smartphone, with lower-income Americans and those ages 50 and older exhibiting a sharp uptick in ownership over the past year." Of further note, smartphone adoption, according to Pew, "has more than doubled since the Center began surveying on this topic in 2011: That year, 35 percent of Americans reported that they owned a smartphone of some kind." And increasingly, Americans are using their mobile devices to make purchases. Pew also found in 2016 that "46 percent of U.S. consumers report having made a mobile payment, which translates to approximately 114 million adults," with nearly three-quarters of mobile payment users being Millennials and Gen-Xers, who, it's safe to assume, won't be abandoning such practices in droves in the decades to come. Benefits of meter apps extend beyond the individual consumer to municipalities as wholes, particularly smaller, often cash-strapped ones. "It's so much cheaper for the cities, because they have no hardware to pay for," Donald Shoup, a professor of urban planning at the University of California at Los Angeles, told Philly.com's Michaelle Bond in May 2018. And as Flowbird, a parking and transport ticketing company reports, "most, if not all, major cities now offer payment apps," as noted in Bond's article. So, Erie's finally joining the majority (hooray! ), with most app traction's happening within the last three years. And, replacing or ripping up Erie's more than 1,700 meters individually would be in-the-millions costly. Leaving them in place both keeps the coin-using community content and provides a way for the app to track parking spots. In Erie's case, each meter features its own identification number. That is, the cost to Erie to adopt app-based meter pay is zero dollars, and the longer Erie might've waited to go digital, well, "a day late a dollar short" is apropos. "For Erie, by Erie," says James Moelk, one of the three partners involved in meterEZ. "We really thought that we had a chance; here's a tech company in Erie — and we're always screaming for tech jobs — and we created them. It seemed like an obvious solution." meterEZ includes weCreate's three co-owners (Wheeler, Lanich, and Brian Bohrer); Moelk, a developer and marketer, who's worked on prior projects with weCreate; and John Szymanski, another developer who worked on the front end of meterEZ. Erie tech-group weCreate (members featured above) built an app (meterEZ) to simplfy the parking process and make it possible to pay meters from one's smartphone. The concept began after Moelk, who is quick to admit he's not the quarter-carrying type, continued racking up parking tickets. "I thought that there's got to be a better way," he says, noting he then observed the unique identifying numbers on each meter. "All of the dots just connected then that there's got be to a system that we can integrate that connects the payment gateway." So Moelk approached Wheeler and the group approached the Erie Parking Authority to pitch their idea. While they weren't initially under contract, the team continued to labor on the project, notching more than 2,000 hours in development time. "Now we've exceeded 3,000," Moelk points out, on an app that Wheeler says will always be free to download. "[The Parking Authority] wanted to see that we could actually produce what we said we could produce," Wheeler notes. "We completely developed the app before we got the contract." Then, the Parking Authority signed on and meterEZ ran a few week beta period to test the app. Then, they got a call: Can you come to the Mayor's press conference in a couple of days? The answer: Yes. Up went stickers on each meter throughout the city (the meterEZ team did all of the peeling and sticking in a breath-taking 18 hours), alerting parkers on how to download and use the app as well as the note about a $3 sign-up bonus and the $2 refer-a-friend incentives. And then, Erie had the option to quit quarters. "I've yet to have the app crash on me, and I'm proud of that," Moelk says, adding: "It's not just an app built here, it's a really good app," which the meterEZ team built from scratch. Qualifying good, self-proclaimed "quarter-quitter" Brian Slawin, Regional Director and Portfolio Manager at Ben Franklin Technology Partners, weighs in: "It's stunning, frankly, that a [first version] of any technology product just simply works," he wrote on my Facebook wall when I put out a call for feedback from those who've used the app (more on that later). "I'm not sure I've ever seen a [software as a service] delivered cloud product just work, right out of the box; especially at scale. Kudos to Zachary Lanich and his team for making such a rock solid tool." As of Sept. 10, 5,100 people have downloaded the app with an average of 100 new downloaders per day, an uptick in daily downloads since the out-of-the-gate rate, according to Moelk. Wheeler puts the user adoption rates at 5 to 10 percent of Erie parkers so far, and Moelk says they have the goal of achieving 50 percent, an industry benchmark. As it stands, Erie's adoption rate is on par with larger cities introducing apps, such as Philadelphia, which started at 10 percent adoption the first year of using meterUP. The app's user interface is both easy and straightforward: Create a profile and both add your vehicle (including license plate) and credit card information. Of note: You can register multiple vehicles and credit cards and toggle through them in the app's settings. The app tracks when meters are enforced, so if for some reason you want to try to pay after 6 p.m. at a meter that isn't running 24/7, it'll alert you. But, say that you're within that window that you do need to pay, you enter the meter's space number (the four-digit number featured on the street-facing side of each of Erie's 1,700 parking meters) and decide how you want to pay: Either using your "wallet" or an individual credit card purchase. Wheeler says his company is quick to encourage downloaders to utilize the wallet feature, which limits the credit card transaction fee to one ding per wallet-fill, rather than a per-session-purchase charge. It's a 40 cent fee for an individual credit card, half of that with the wallet. Fees like this are common to such apps, with Philadelphia, for instance, charging 40 cents per transaction. According to Moelk, the team is continually exploring more payment options. "People see 20 cents, 40 cents, yeah, that'd be nice if we walked with that," Moelk laughs. "But that's not the case. "There are profits, and we will make money. But the idea is: if we get this right, we can take it to another municipality and another municipality, and in time the profits will come." And that's one of meterEZ's goal: Prove this works in Erie, perfect the platform, and be able to shop it elsewhere, both locally and beyond. Beyond the fees, the app functions in parallel to the principles of parkers using quarters. To wit, time is purchased on the app in the same amount a quarter will buy you. And you can add to existing time on your session; the convenience of the app is that you can do that right from your phone. Too, if a meter is time-limited (like those yellow meters that max out at 30 minutes or various downtown meters at two hours), the app reflects those restrictions. Say you miss your window to add more time to your session. 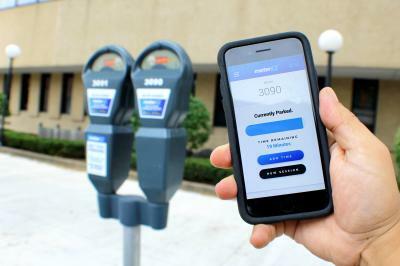 A new feature in the app alerts users to the last meter — using the four-digit ID number — they parked at, an update that occurred just a few days after Amanda Kochirka, Business Outreach Specialist at the Erie Regional Chamber and Growth Partnership, commented on my Facebook post calling for feedback proposed such an idea. "The No. 1 confusing thing: The flag is not going to change," Moelk says. "We try to push that in every media opportunity that these are not smart meters," Wheeler adds. "This is a completely separate solution." Like how Uber passengers have a different app than Uber drivers, meterEZ created an app for parkers and meter readers, respectively. Initially, meterEZ equipped readers with five smart tablets — the kind that are shock-proof, water-proof, and essentially Erie winter-proof — but UpSafety, a company the Parking Authority is working with now to upgrade other tech, including portable printers for readers, hosts the readers' app. While the flag remains red, readers recognize whether a parking session is valid. And, in the event a user is inaccurately ticketed, meterEZ's website features the ability to communicate that. Because they're logging the parking data, meterEZ develops can prove the ticket's accuracy. "EPA didn't really have that much data on how and why people parked and that's going to be a really interesting thing that comes from this," Wheeler says. Moelk adds that there'll be "No selling data. We don't want that done with our stuff, so we're not doing that to you." Moelk and Wheeler say they've received overwhelmingly positive feedback from users. Not to just take their word for it, I put that call out for feedback on Facebook. The comments ranged mostly from excited to appreciative to full-throated adoption. Former Erie Mayoral Republican candidate and regular Facebook dissenter and watchdog Jon Whaley wrote: "I initially was a big naysayer. I was sure that a local company would waste time and $$$ and just replicate what was already available. I downloaded the app and use it all the time. Love it." Notable, too, was Lanich's active engagement with the commenters. I didn't tell meterEZ I planned to post this. No heads-up at all. But as the comments began coming in, Lanich addressed the recommendations in real-time, including something Wheeler noted in my interview with him: The ability of businesses and organizations to validate someone's parking session, something that's on the development horizon. Which leads one to wonder what the engagement of one of the big dogs in the parking app industry might be have been like. Also on the horizon, Moelk is excited about integrating local events on the app in what he calls "non-obtrusive ways." "Not ads, but events," he stresses. "We want it to be meaningful." "One thing we all hate as consumers is being inundated with ads," Wheeler adds. "We get it everywhere we go, so we really want to have information that people are going to find valuable and want to look at as opposed to…"
"Because as soon as you do that, no one is going to look at the events or want to use the app," Moelk interjects. "We want this to be a value-driven app." Have quarters taken a backseat to quarters in 2018? It's safer to say they're still riding in the front of the car, but perhaps not in the driver's seat, as meterEZ is driving Erie, like many other cities, into the future of paid parking. "We're going to be continuing to look for ways to make life easier, make life better," Wheeler says. Ben Speggen can be contacted at bSpeggen@ErieReader.com. You can follow him on Twitter @BenSpeggen.